WE SELL NATION AND INTERNATIONAL WIDE if you do not see a container in the area that you need it just email us with where you want the container delivered to and if you need it delivered on a tilt bed truck that can unload OR on a Flat bed which means that you will have to have a forklift or crane to unload the container. And we will create a listing for you. We sell 10s 20s 40s and 40 high cubes. In some areas we can get 45,48 or 53' containers. They are not as common and not always available but feel free to check with us. We will be glad to check availability for you. PRICE VARIES BY LOCATION. Cargo Container have many uses. Simple and complex homes are being built out of cargo containers. They are also used for warehousing of goods, Construction site storage, Temporary offices, Fireworks storage ( Yes they are approved for class B explosives ) The possibilities are unlimited. Dimensions on a 45 foot container are 40'L X 8'W X 9 1/2'T They are made with 14 gauge steel walls and have wood floors. They have one set of double doors on one end of the container. NEW CONTAINERS ARE AVAILABLE IN MOST LOCATIONS ALSO ! You can pick up the container at the depot OR we can have the container delivered with a truck that can unload at the site. If you can unload we can also provide quotes for flat bed deliveries. PLEASE CONTACT US BEFORE YOU BID FOR A QUOTE ON TRUCKING AND TO DOUBLE CHECK AVAILABILITY. All of our containers will be inspected to make sure they are structurally sound and wind and water tight. 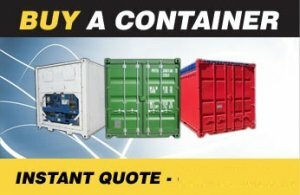 We do not buy damaged containers and repair them. We buy lease returns or containers that are retired due to time not damage. The picture shown is only a representation of the type of cargo container that we sell but may not be the exact container that you receive. The colors vary and it is not something that we can guarantee. Cargo containers are very over engineered for what most of us will use them for. They hold a great deal of weight and are stacked full up to six tall on the ground and on ships that move. Payments must clear before we release or deliver the container. Delivery charges and any applicable sales taxes are to be paid by the buyer as well. The container yards DO NOT ACCEPT PAYMENTS. All purchases must be paid for and cleared BEFORE the container will be released or delivered to the customer. Used containers will have imperfections such as spots of rust, Small dents, Ripples in the corrugation but are wind and water tight and structurally sound. The door seals will be good and the doors operate. Perfect for many uses !